The most common problem with the detergent doors on KitchenAid dishwashers is that they either don't open during the cycle or open only halfway. Before looking into more complicated repairs, make sure that the door is able to open. Check the seal around the door and the door latch for soap- and food-related gunk, and scrub it off if present. Sometimes this can keep the detergent door from operating properly. Consider switching detergents, as some liquids and pouch-style dish detergents can gum up the detergent dispensers. Also, make sure that there is nothing blocking the detergent door when the dishwasher is loaded. Because of the location of the detergent door, a large item such as a cookie sheet or a pan can prevent the door from opening. Run the dishwasher through a cycle without anything placed in front of the detergent dispenser and see if that solves the problem. KitchenAid dishwashers rely on an internal timer to complete the wash cycle properly. 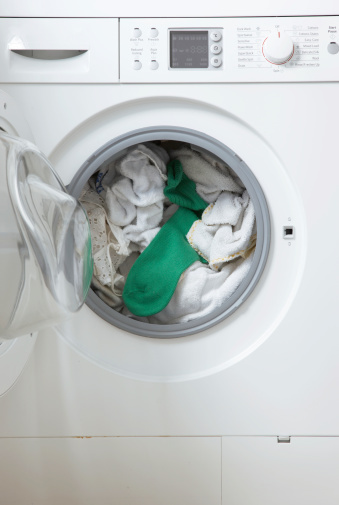 When this timer malfunctions, certain steps in the wash process (such as the release of soap from the detergent dispenser) can be interrupted. If the dishwasher detergent door is either not opening or appears to be opening late in the cycle, this is likely the mechanical culprit. A broken timer isn't something that's simple to replace without knowledge of dishwasher repair, so it's best to consult a professional if you suspect that this is the problem. For the detergent door to function properly, all of its mechanical components must be in working order. Older dishwashers' detergent doors rely on a spring-loaded hinge to pop all the way open when the timer gives the signal. If the door doesn't swing all the way open instantly when it's manually released, the spring may need to be replaced for the dispenser to operate properly. If the particular model is newer and does not rely on a spring to open the door, chances are it either uses a wax motor or a bi-metal switch to release the detergent door at the appropriate time. If either of these components is dying, that can mean that the detergent dispenser will not operate properly.